Down this page a ways there is a picture of the scene at the bataclan, and that picture was obviously, from the dryness of the blood, taken at least two hours after the shooting. Two hours after the shooting, the place should be flooded with EMT's and police, yet the entire shooting scene is devoid of people. This would only happen if the authorities set it up and wanted their photos and took so long setting it all up that the blood trails are dry at the ends of them, and only red near the bodies because the bodies were bleeding out that last little bit. Also, from the different blood colors, people were obviously shot over a period of hours as they were brought in and murdered to set up this scene. This one is sewn up in a body bag, ARCHIVE AND POST! BUSTED: A GLITCH IN THE MEXICAN MEDIA HAS GIVEN STRONG EVIDENCE THAT THE FRENCH GOVERNMENT MURDERED "VICTIMS" WHILE IN CUSTODY OF THE AUTHORITIES. WE DEFINITELY HAVE A LOT OF DEAD PEOPLE IN THESE "TERROR ATTACKS" AND IT LOOKS LIKE NONE DIED "IN THE NAME OF ISLAM". BUSTED: A MEXICAN GIRL (Nohemi Gonzalez) WHO DIED WAS CONFIRMED ALIVE AFTER THE BATACLAN SHOOTING WHEN HER FAMILY CALLED HER BOYFRIEND'S PHONE AFTER HEARING ABOUT THE SHOOTING IN THE MEXICAN MEDIA. THEY TRIED CONTACTING HER REPEATEDLY ON HER OWN PHONE AND THEN TRIED HER BOYFRIEND'S PHONE. HE SAID HE WAS WITH HER AND THEY WERE BOTH FINE AND THE SHOOTING WAS OVER, AND NOW, AFTER THE AUTHORITIES TOOK HER INTO CUSTODY THE FAMILY HAS RECEIVED A REPORT THAT SHE IS DEAD AND HER FAMILY IS WONDERING HOW SHE IS DEAD WHEN THEY RECEIVED THE REPORT SHE WAS FINE STRAIGHT FROM HER BOYFRIEND A CONSIDERABLE TIME AFTER THE "TERRORIST" ATTACKS. BUSTED BUSTED BUSTED, IT IS ALL BUT ADMITTED THAT THERE WERE NO TERRORISTS, AND THAT THE FRENCH GOVERNMENT DID THIS JOB, AND IT IS A FILTHY FALSE FLAG. 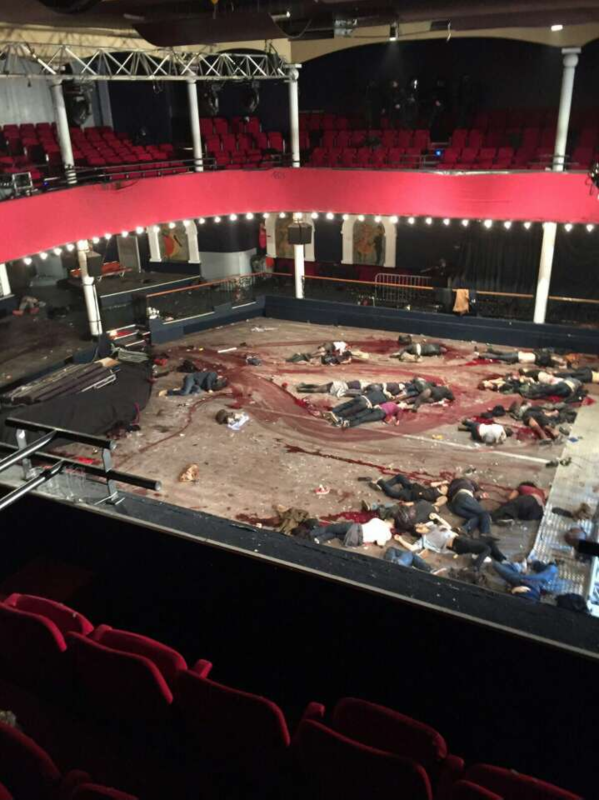 THE FACT Nohemi Gonzalez WAS ALIVE CAME ACROSS THE TELEVISION WHILE I WAS GOING OVER THE PHOTOS OF THE BATACLAN. THE DEAD BODY SCENE LOOKED REAL, BUT WAS TOO LOW RES TO WORK WITH. THEN THIS REPORT CAME ACROSS THE TV WITH THE GIRL'S FAMILY ON TELEVISION, SAYING IT LIKE IT HAPPENED FROM THEIR PERSPECTIVE. THEY CONFIRMED SHE WAS NOT SHOT AFTER THEY HEARD ABOUT THE SHOOTINGS IN THE PRESS. THEY GOT AHOLD OF HER BOYFRIEND AFTER THE BATACLAN WAS EMPTY (UPDATE, LONG AFTER THE BATACLAN WAS EMPTY, AND I AM TALKING PROBABLY HOURS), WHO WAS WITH HER ALIVE AND TOTALLY UNHURT AWAY FROM THE THEATER AT AN UN NAMED LOCATION. NOW, AFTER SHE WAS REPORTED TOTALLY UNHURT LONG AFTER THINGS COOLED OFF SHE HAS BEEN CONFIRMED DEAD AND A "VICTIM" OF THE ATTACKS AND HER FAMILY IS WONDERING HOW, WHEN THEY CONFIRMED SHE WAS NOT HURT AND ALL WAS WELL. This might be the first time ever the perpetrators of a false flag got busted by their own media, I REPEAT: A MEXICAN VICTIM WAS CONFIRMED ALIVE AND UNHURT AFTER THE BATACLAN "SHOOTING", ONLY TO END UP DEAD FOR THE PHOTO SHOOT. THE FRENCH GOVERNMENT DID THIS, NO IFS OR BUTS. Now let's keep an eye on the distribution of deaths, to find out if the authorities ID'd people before killing them, to get deaths from as many countries as possible. If there are deaths from everywhere, that is exactly what they did - the French checked ID's to decide who they would kill based upon where they were from, to get as many countries as possible to stand behind a war on Islam after "Islam" killed one of their own . . . . . Anything to get their world war 3, ANYTHING. I am actually pissed off beyond belief, of all the gall! They needed a real body count so they murdered people who were PROVEN ALIVE after the "event!" Ok, after working on this for a while, things are coming into view. Here is what likely happened: Agents, not "terrorists" got a small body count at the scene, and then spiced it with people they detained afterwards. That makes the most sense based on various reports, they did not kill all "in custody", they spiced it with people they needed dead for the most political gain by murdering people who were selected for their nationality via their ID's while in custody. The Mexican victim's family is questioning how on earth she is dead when she was alive after everything settled down, ALIVE LONG ENOUGH AFTER IT ALL FOR THE MEDIA TO HAVE REPORTED IT, AND FOR THEM TO TRY TO CALL AFTER HEARING ABOUT IT. THIS GIRL'S FAMILY WAS IN MEXICO, THIS NEWS DID NOT BREAK IN MEXICO IN FIVE MINUTES. IT TOOK A LOT LONGER THAN THAT, HOW ON EARTH DID THIS GIRL END UP DEAD WHEN SHE WAS FINE WHEN THIS HIT THE NEWS IN MEXICO, LONG ENOUGH FOR HER FAMILY TO RESPOND TO THE NEWS OF THE ATTACK AT THE BATACLAN AND CALL? This latest event might be what kills false flags, the French government is BUSTED WHOLESALE. 1. No EMT response. If this setup was not wanted by the government, EMT's would be all over it, dragging even known dead bodies to the hospital to be PROVEN DEAD. 2. No police response. If this was a scene that was not set up by the government, police would be ALL OVER IT. 3. Five people standing on the balcony, 1 photographer, and one guy on the ground floor. NOT A SINGLE ONE out with the bodies. 4. 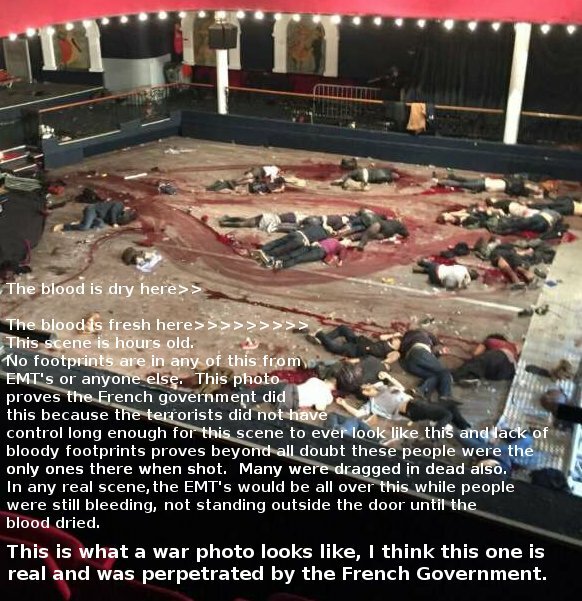 Want proof the French government did this? LOOK HOW DRY THE BLOOD IS. The blood is THAT DRY yet no EMT's have ever been on this scene because there are zero footprints through any of it, which proves that not only are they not there now, they were never there in the hours prior while that blood was drying. And the only way "hours" could pass like that is if the authorities in charge staged this and murdered everyone in this picture. If terrorists did this, the authorities would have flooded this scene and EMT's would have been there clearing out bodies while people were still spurting blood. Who knows when this even happened, - with how long this took to get published, and that Mexican girl alive long after the shooting only to end up dead here, this could have been staged an entire day later. 6. The Bataclan theater has many options for floor and seating arrangements, but in all past photos from before this "shooting", they try to at least maintain the honor of the theater by not having an event done on bare concrete. Why is the concrete in this photo bare? OBVIOUSLY TO AVOID MESSING UP A PREMIUM FLOOR COVERING STAGING THIS SHOT. 7. THIS PHOTO, WHICH IS THE ONLY PHOTO, IN ITS HIGHEST RESOLUTION IS STILL SUPER LOW RESOLUTION, WHICH WILL PREVENT PEOPLE FROM PICKING IT APART. It was not bad enough for them to release a screen capture, but even for a screen capture this is garbage. It looks "clear" until you try to do anything with it, like look for bullet holes in the theater. The resolution of the photo is not adequate to reveal a single one, IF any exist at all and if these people were killed selectively by authorities on scene and elsewhere, there would probably be few, if any bullet holes in the theater.